Post your favorit book set in a country that anda want to visit? Post your favorit book set in your halaman awal country. a comment was made to the poll: What's lebih annoying? a comment was made to the poll: 3 buku That Have Entranced Me: Which do anda prefer/looks most interesting? 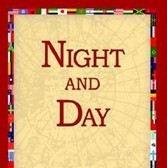 Who is penulis of “Night and Day”?